Two of the pigs killed by the deputy were just three weeks old and weighed only eight pounds. Byron, GA — A woman is seeking answers this week after Peach County deputies showed up in her neighborhood and shot and killed her five small pigs. Cheyenne Fagre is now grieving after the deputy made the sick and sadistic decision to kill all five of her small pigs, — Chewy, Petunia, Rusty, Wesley and Yoda. Fagre explained that her neighbor called the deputies for help rounding up the pigs — not to kill them. She noted that the pigs were only loose for about an hour before the deputy showed up and opened fire on them. “It was around 8 a.m., we instantly ran out there and started searching in the woods and everywhere around their cage. It was about an hour we were looking back there and then we started driving the neighborhood and asking people outside and no one had seen them,” she said. Fagre explained to WMAZ that she has since filed a complaint with the Peach County sheriff’s office. She says they are now looking into whether the deputy was justified in his use of deadly force. According to WMAZ, an incident report from the sheriff’s office says a neighbor called claiming there were “wild hogs” in her front lawn. When deputies arrived, they attempted to round up the pigs. Fagre posted about her pigs being killed on Facebook and she’s received an outpouring of support. After reading through her posts, Fagre thought her pigs had been missing for days. As she searched for them, hanging up flyers and talking to neighbors, she had no idea they had been killed just an hour after they got out. Once she found out the pigs were slaughtered by a deputy, her heart was broken. “My domesticated pigs were shot by an officer of peach county sheriff department when reported in someone’s yard. They were missing for an hr or less when killed,” Fagre wrote on Facebook. Showing the unnecessary nature of the killings was the fact that some of the pigs were babies and weighed less than 8 pounds. “Everyone’s just as heartbroken as I am and wondering why, we just don’t know why, especially all of them, two of them being literally just 8 pounds,” she said. According to WMAZ, Peach County Sheriff Terry Deese says they are investigating the killings and do plan staff training on responding to livestock calls. 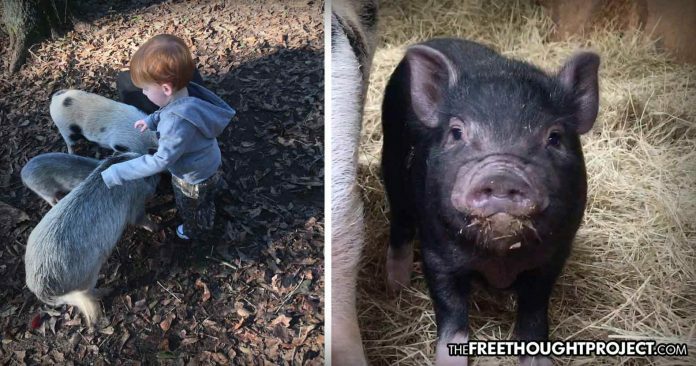 While the Free Thought Project has reported on numerous instances of police officers killing animals, in our many years at it, we’ve never seen a cop kill five pigs, including two babies. This is truly disturbing. We have also seen police officers shooting kittens in front of children. According to the North Ridgeville Police Department in Ohio, the police did nothing wrong when they discharged their weapons a few feet away from children in order to euthanize 5 kittens in 2013. Also, last year, Matt Minnick, a small farmer in Portland, learned the hard way about police killing animals after a Washington County Sheriff’s Office Deputy feared for his life and shot and killed his top breeding goat—an animal that fills petting zoos across the world. In 2015, another Washington County Sheriff’s Office Deputy shot and killed a 30-year-old pony, leaving a family heartbroken. The department was then caught covering up what really happened. Sadly, the list of family pets who’ve met an early demise is far too long.